In this study we investigate the active constituents of the rhizome of Zingiber officinale, Roscoe (ginger) and determine their activity on glucose uptake in cultured L6 myotubes and the molecular mechanism underlying this action. Freeze-dried ginger powder was extracted with ethyl acetate (1 kg/3 L) to give the total ginger extract, which was then separated into seven fractions, consisting of nonpolar to moderately polar compounds, using a short-column vacuum chromatographic method. The most active fraction (F7) was further purified for identification of its active components. The effect of the extract, fractions, and purified compounds on glucose uptake was evaluated using radioactive labelled 2-[1,2-3H]-deoxy-D-glucose in L6 myotubes. The pungent phenolic gingerol constituents were identified as the major active compounds in the ginger extract enhancing glucose uptake. (S)--Gingerol was the most abundant component among the gingerols, however, (S)--gingerol was the most potent on glucose uptake. 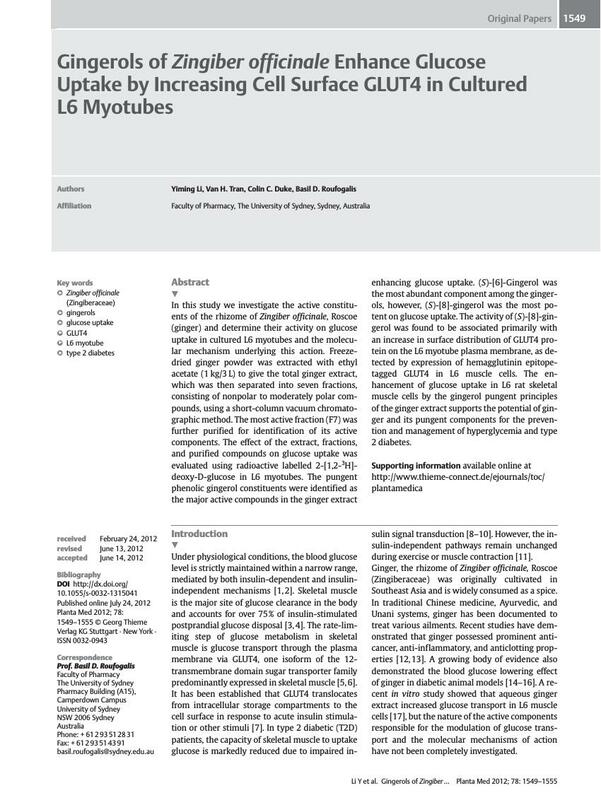 The activity of (S)--gingerol was found to be associated primarily with an increase in surface distribution of GLUT4 protein on the L6 myotube plasma membrane, as detected by expression of hemagglutinin epitope-tagged GLUT4 in L6 muscle cells. The enhancement of glucose uptake in L6 rat skeletal muscle cells by the gingerol pungent principles of the ginger extract supports the potential of ginger and its pungent components for the prevention and management of hyperglycemia and type 2 diabetes.